The Secret Life Of Walter Mitty, a second big-screen adaptation of James Thurber’s short story about a man who escapes his humdrum existence via elaborate fantasies, has been bouncing around from one director to another for years. It’s apt that it landed in Ben Stiller’s lap. As a director, Stiller has dealt with the divide between reality and make-believe from the start. His 1994 feature directorial debut, Reality Bites, hinged on a protagonist’s efforts to document the uncertain lives of her recently graduated friends, and the attempts of a television producer (played by Stiller) to distort those ambitions into corporate product. In The Cable Guy, Stiller cast Jim Carrey as a man so warped by the seductive fantasies of television that he’s traded in his real name for that of a sitcom character. Even Zoolander and Tropic Thunder, Stiller’s most straightforwardly comedic films, are ultimately about how their superficial heroes are, however accidentally, moving toward becoming more authentic people. Stiller plays Walter Mitty, a man more than a decade into a career handling photo negatives for Life magazine. But the increasing digitalization of photography would make his profession look iffier by the day even if Life wasn’t on its last legs. Walter is first seen trying to deal with a different kind of digitalization: With a Norman Rockwell print in the background, he struggles to work up the courage to flirt with Cheryl (Kristen Wiig), an appealing new co-worker, via an online dating service. He eventually does, only to be told by an aggressively helpful customer-service rep (Patton Oswalt) that his profile needs fleshing out. It looks like he’s been nowhere and done nothing. And really, he hasn’t. Hence Walter’s tendency to zone out and imagine himself as the hero of a far more exciting world than the one in which he lives, one in which he rushes into exploding buildings to save Cheryl’s three-legged dog, or does battle in the streets of New York with the sleazy exec (Adam Scott) who’s certain to downsize him. Meanwhile, the possibility of real adventure seems to be passing him by. Or nearly passing him by: When Walter can’t locate the negative of an image that star photographer Sean O’Connell (Sean Penn) has earmarked for the magazine’s final print edition—a shot O’Connell has described as “the quintessence of Life”—Walter decides to track him down personally. The journey takes him to Greenland and points beyond. At this point, a gap widens between the sort of movie The Secret Of Life Of Walter Mitty wants to be, and the sort of movie it actually is. Stiller and cinematographer Stuart Dryburgh shoot the film with an eye toward grandeur. Whether framing Walter against office backgrounds that threaten to overwhelm him or against mountainous landscapes, the film’s every shot calls attention to its own ambition. Which would be fine if it lived up to those ambitions, which for a while it seems capable of doing. In reality, Life now mostly exists as a photo archive, but Stiller deftly uses some of its iconic covers to suggest the fading of a whole way of looking at America, the passing of an era in which magazine-stands served as the nation’s mirror. It’s on to something, too, with its depiction of the way technology has isolated Walter. A man in full in the way Walter only wishes he could be, Sean O’Connell tellingly not only refuses to shoot digitally, but carries no cell phone. Stiller’s hangdog look and defeated slouch as Walter suggests a man for whom the grid has become a prison. Who wouldn’t turn to daydreams? 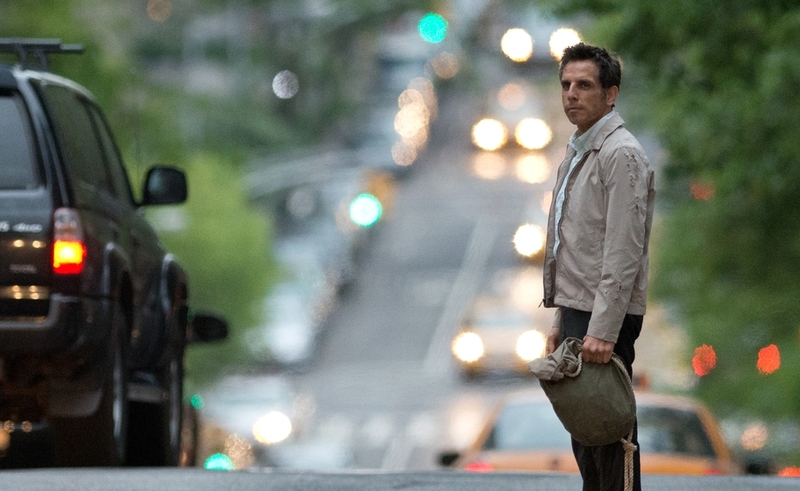 For a while, The Secret Life Of Walter Mitty feels like a Big Movie about How We Live Now. What a shame that it quickly becomes yet another fuzzy story of self-realization, a movie about believing in yourself and following dreams and all the other vague feel-goodisms that have plagued big-budget comedies since they started to look to the self-help section for inspiration. (Walter only needs a neglected child he learns to pay attention to for the film to be the full package in that respect.) As Steve Conrad’s script reveals Walter’s backstory—in part through a largely squandered Shirley MacLaine as his mother—he emerges as a Gen-X George Bailey whose father’s death kept him from his plans to travel the world, back when he was a mohawked skateboarding enthusiast. But unlike Bailey, Walter has no wonderful life hidden beneath the surface of his frustration, so he blows his savings on a string of picturesque travels and the film follows along, largely dropping the fantasy sequences as his reality gets better. Also unlike Bailey, Stiller never really finds the remarkable individual within the shell of his everyman. His Walter loses the put-upon meekness, but never becomes much of a character. Visually, the film is ambitious to the end, filled with beautiful images and a few remarkable sequences, like a last-second decision to board a helicopter that captures Walter’s struggle with his own fear as “Space Oddity” swells on the soundtrack. As a comedy, it’s largely a whiff. The fantasy sequences feel more abrasive than inventive, and sometimes they’re just misconceived, as in a long bit parodying The Curious Case Of Benjamin Button. (Oswalt’s phone calls are consistently funny, though, and Icelandic actor Ólafur Darri Ólafsson has some nice moments as a drunken karaoke enthusiast.) And as a story, it never stops playing it safe. There aren’t many obstacles to the hero getting the girl—Cheryl seems imminently gettable from the first—and the search for the quintessence of Life never plays like a search for the quintessence of, well, life. The triumphs feel engineered, and the realizations overheated. Seldom has a globe-spanning, soul-plumbing search for what really matters looked so inconsequential.